Air pollution index in Central reaches 172 yesterday. Yesterday the air pollution in Hong Kong is serious. The air pollution index in Central reaches 172 which is the second high record since 2000. The roadside readings in Causeway Bay and Mong Kok were also serious, recorded 142 and 135 respectively. The cause of the serious pollution yesterday was high levels of nitrogen dioxide. At 8pm they were nearly 50 per cent above the target and double the new limit the government has proposed. The dispersion of pollutant was reduced because of the impact of Severe Tropical Storm Lupit near the Philippines. But surprisingly the air quality in the Pearl River Delta had improved. The average concentration of sulphur dioxide was decreased, while other pollutants for example ozone had increased. This show the fact that air pollution is very complex, it various in types of pollutants and different locations, and is affected by many external factors. However, we can still do much on it. Try to imagine if our air is clean with only a few pollutants, even we are under the impact of the typhoon and the dispersion of pollutant was reduced, we can still breathe clean air. 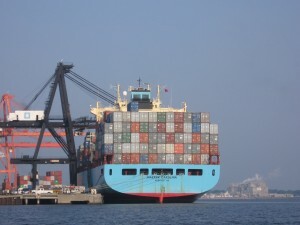 Container ship can be serious pollution source. To tackle air pollution problem, government’s effort is very important. If the government frames the problem properly, then she can increase the effectiveness of the policy adopted. 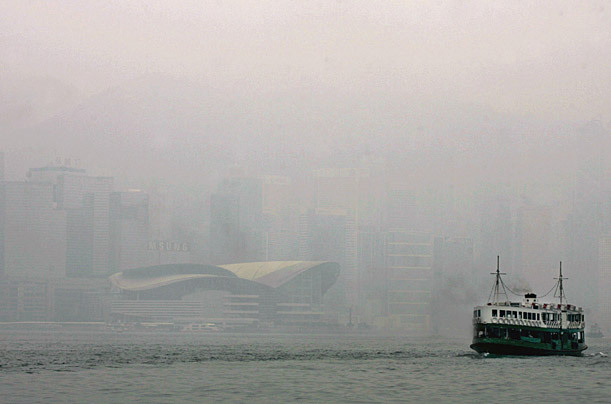 However, the HKSAR Government had made two mistakes on the air pollution issue. Firstly, she claimed that we can do nothing about the poor air quality in Hong Kong, as the pollutants are mainly coming from the Guangdong area but not coming from Hong Kong people. Secondly, she thought that the main source of air pollution is coming from the land, so the measures tackling air pollution are mainly imposed on vehicles. However the government is ignoring the impact of marine air pollution. Study from University of Science and Technology shown that one of the main pollution sources in Hong Kong is the container port located in Kwai Chung. The sulphur dioxide emitted by port facilities and containers put the health of three million people at risk. But we can see the government do not adopted measure that tackling the problem, and let the pollution Leviathan, the containers, continuous to emitted pollutants. The government claims that the cross-border winds bring the pollutants from the Guangdong area. But the case is that the control over the vessels and port facilities can improve the air pollution problem a lot. Hit the jump for more information about the facts about containers pollutions. Chief Executive Donald Tsang Yam-kuen on Wednesday announced some new initiatives aimed at helping to protect Hong Kong’s environment. Near the end of his 90 minute annual policy address, Tsang told the Legislative Council the government planned to replace incandescent light bulbs with compact fluorescent lamps (CFLs). “CFLs consume 70 per cent less electricity than incandescent light bulbs of the same light intensity,” he explained. He said the government would also promote electric vehicles. “The Environment Bureau [ENB] has been working with a number of electric vehicle manufacturers. We expect a supply of around 200 electric vehicles for the local market in the coming financial year,” he said. The chief executive said the government would work with the two power companies to launch an electric vehicle leasing scheme by the end of 2010. “Upon implementation of these two programmes, Hong Kong will rank second in Asia after Japan, where electric vehicles are most widely used,” Tsang said. He said the government would continue to encourage different sectors to conduct carbon audits in buildings and to reduce carbon emissions. “Last year, more than 100 organisations joined the initiative. As for the proposed district cooling system at the Kai Tak Development, construction works are expected to commence early next year,” the chief executive said. Plans to boost innovation and technology by allocating about HK$200 million to launch an “R&D Cash Rebate Scheme”. “Under this scheme, enterprises conducting applied research and development projects with the support of the Innovation and Technology Fund or in partnership with local designated research institutions will enjoy a cash rebate equivalent to 10 per cent of their investments,” he said. Encourage greater co-operation between Hong Kong and Shanghai. Tsang said the two cities should work together, adding: “The competition between Hong Kong and Shanghai is not a zero-sum game. Further development of Hong Kong’s medical sector. The government would invite expressions of interest from the market to develop private hospitals. These could provide traditional Chinese medicine on four sites at Wong Chuk Hang, Tseung Kwan O, Tai Po and Lantau. Tsang said the government planned to introduce standards for Chinese herbal medicines in Hong Kong. “We aim to extend our coverage from the current 60 herbal medicines to about 200 by 2012,” he said. Developing Hong Kong’s status as a regional education hub. The government would increase the total commitment of its start-up loan scheme by HK$2 billion to help higher institutions meet the costs of purpose-built accommodation and facilities. It has also allocated four greenfield sites to four operators for international school development. Opening up the mainland market further for Hong Kong’s creative industries – for example, the film industry under the Closer Economic Partnership Arrangement (Cepa). Improving urban air quality through advocacy, education and empowering the public. Founded 12 years ago Clear The Air counts now over 1000 members through the reach of its website and Facebook profile. Actions have ranged from published articles, to speaking at Legco, education and advocacy campaigns to cut harmful and polluting emissions at the source. The launch of the Hong Kong Earth Champions Knowledge Pond will be a celebrated unveiling of a rich and diverse collection of local wisdom and environmental solutions from the community of Hong Kong. The Knowledge Pond is a resource that will serve to improve Hong Kong’s local environment by offering practical solutions and knowledge tha can help the community alleviate climate change.